The growing popularity of internet auctions has been a real boost to antique collecting since anyone with a computer can now market an item to potentially millions of collectors. But the downside is that the problem of misidentified and misrepresented items is now rampant. For railroadiana collectors, this problem shows up when sellers claim that an item has a railroad purpose or origin when in fact it has nothing to do with railroads. In the vast majority of such cases, the seller is probably innocent or just careless, but there is always the possibility that a seller is dishonestly capitalizing on the romance and aura of railroading to raise the value of an item. Veteran collectors are not likely to be fooled, but new collectors may be, and that's bad for the hobby. This page shows some frequently misidentified "railroad" items. These aren't fakes or reproductions (covered in a separate section of the website) but legitimate antiques that may be mislabeled or misrepresented. This list is a work in progress -- see note below. Click on any image for a larger version; use your BACK button to return. Lighting. Until the post WW I era, much industrial, domestic and commercial lighting was fueled by combustible fuels like kerosene and various oils. 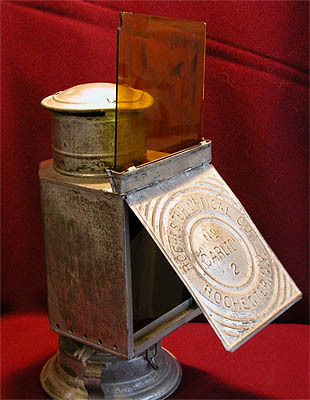 Manufacturers made a vast array of different lanterns and lamps for these markets, and while some people nowadays tend to label all combustible-fuel lanterns as "railroad" lanterns, most were not made for this purpose. In fact, the railroad market was so big that it developed special styles of lighting that tended to have a distinctive appearance -- see our lantern and lamp pages. Following are some commonly misidentified lamps and lanterns. For many pictures of other non-railroad lanterns and lamps see the Lanternnet site. Tubular Lanterns. A very generic class of lantern is the tubular lantern, so called because of the tubes flanking the globe. These were manufactured in many variations and models by different manufacturers - see the Lanternnet site for various Dietz models. Railroad collectors sometimes call these "barn lanterns" (see page on this type), although they were used for many purposes besides farm use. 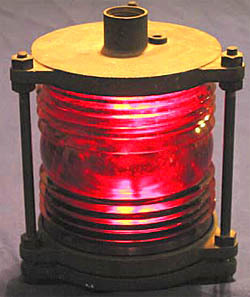 Unless marked for a railroad, these are not railroad lanterns. A Dietz "Blizzard #2" model is shown at right from a 1917 catalog. Driving Lanterns. It's hard to believe that our high-tech, halogen automotive lamps have combustible-fuel ancestors, but Dietz and other companies made lamps such as the Dietz "Eureka" model at right for the early auto and truck market. This model was shown in a 1917 catalog. 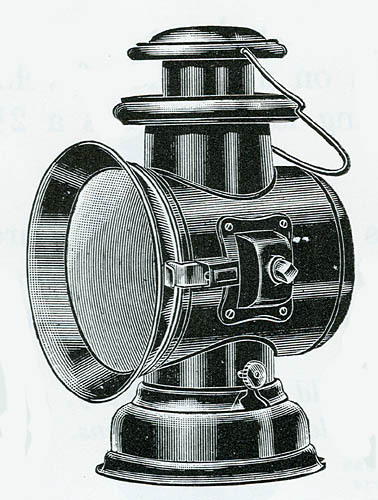 See similar Dietz "Octo" and Dietz "Union" driving lamps. Note that these two have bails -- wire handles -- which may make someone think they are railroad lamps. They're not. Police Lamps. 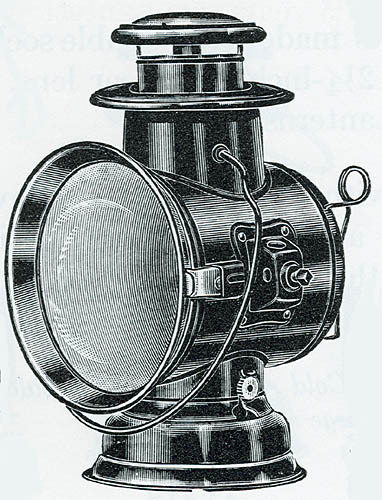 Though this may look vaguely like a railroad semaphore lamp or slow-order lamp, it's a "police lantern" marketed by Dietz in their 1917 catalog. The catalog states, "the lantern may be carried in the hand or attached to a belt by a spring clip." Also, "this type of 'Police' Lantern is known as the 'Flash' through the operator's ability to throw a beam of light or cut it off at will." Wall Lanterns. 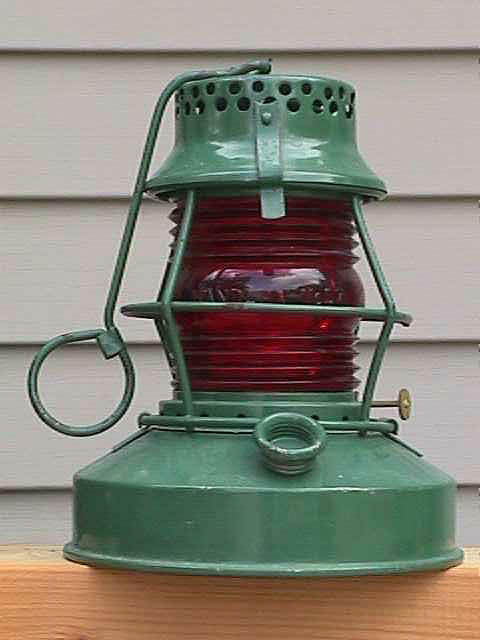 This lantern looks vaguely like a railroad car inspectors lamp/lantern or perhaps a bit like a caboose or bunk lamp. 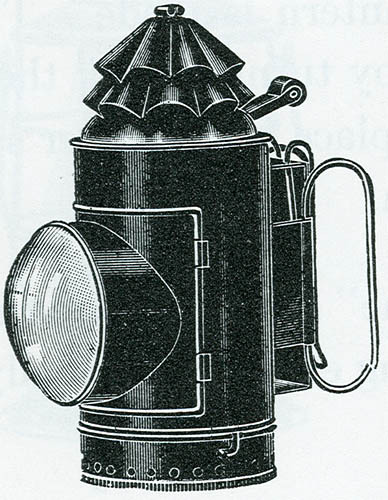 However it is a Dietz "Wall Lantern" made for, "...cellarways, dark passages, stairways, sheds, outhouses, and similar places..." It was shown in their 1917 catalog, which states that "these wall lanterns are not intended for use as portable lanterns or vehicle lights." Darkroom Lamps. 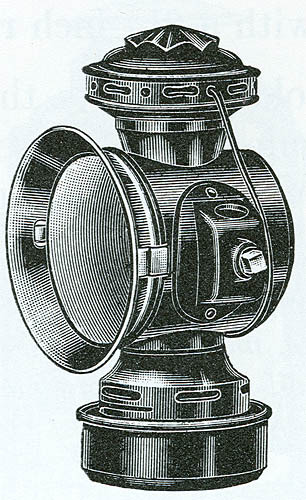 This style of lamp often has yellow and red lenses used in the darkroom to limit the amount of light for film exposure. The shield could be lowered to black out the light without putting out the lantern. It doesn't resemble anything railroad-related but is still sometimes represented as railroad lighting. Utility Lanterns. Utility lanterns sometimes have the general style of a short globe railroad lantern on the top, but the bottom usually has a much larger fuel tank. These have been made for various purposes -- for utility maintenance, traffic control, road construction, and as "truck" lanterns. See page in 1956 Handlan catalog. 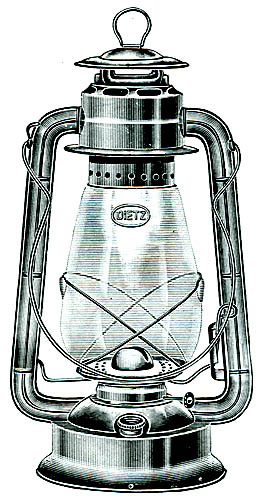 There is a somewhat similar, large-tank lantern marked for the Southern Pacific (Railroad) Company as shown on our Adams & Westlake short-globe lantern page, but generally lanterns like this were owned by municipalities or utilities. If not marked for a railroad, they're not railroad lanterns. Thanks to G.A. Vandercook who also gave us permission to use the image at right. Bridge and Marine Lamps. Bridge lamps and other marine lamps may be related to railroads, since some railroads had extensive marine operations and almost all railroads maintained bridges. However, a claim of railroad origin either has to be backed up by a specific railroad marking on the lamp or a documented history. A vast array of different marine and nautical lamps have been manufactured for use on ships, boats, and water-side facilities. An example of one -- probably a bridge lamp -- is shown at right. More Bridge Lamps. The lift bridge lamp shown at right was made by Armspear Manufacturing and is similar in general design to their railroad lamps. The company probably used some of the same tooling to make all of their lamps. 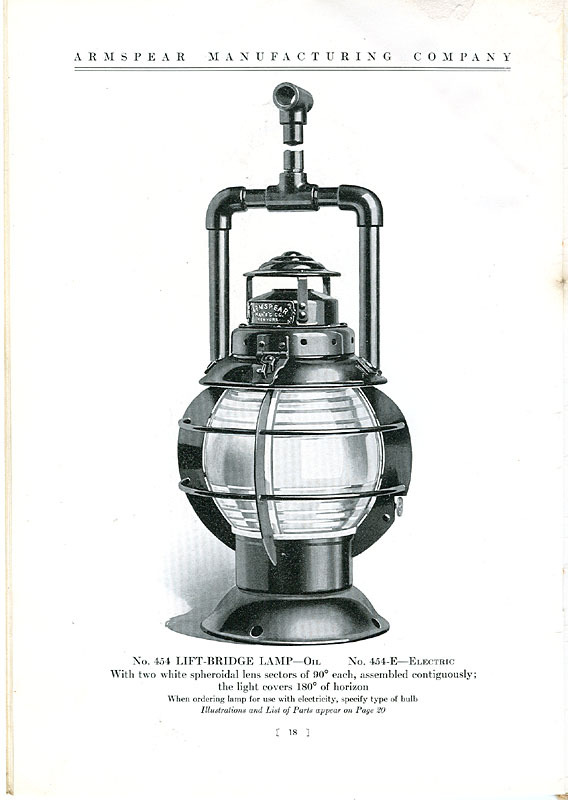 See, for example, Armspear's 1933 catalog, and note that the railroad class and switch lamps have similar design features to the bridge lamps although the latter use different lenses. The larger image linked to the thumbnail image at right is a page from the 1933 catalog. China and Silver items. Many railroad dining car operations used marked china and silver -- see our pages on railroad china. Since these operations were a real point of pride for the railroads, the elegance and distinctiveness of these items were very important to railroad management. In many cases, special china patterns were commissioned, and the surviving examples of these patterns are much prized by collectors. However, there is a tendency for some antique sellers to label all commercial-grade, marked china as "railroad china", when in fact many hotels, restaurants, institutions, and businesses commissioned specially marked china. They still do. Much of this china is as elegant and as beautiful as authentic railroad china, and there are collectors who specialize in it. "WM" China. The initials in the logo at right could be interpreted as those of the Western Maryland Railway, but the pattern does not appear in the known list of this railroad's china. According to a knowledgeable collector from New England, the "WM" on this particular piece is really "MW" which stands for the Mount Washington Hotel in New Hampshire. This pattern frequently turns up in Northern New England. Another page on this website shows an authentic pattern from the Western Maryland Railway -- the "Union Bridge" pattern. No larger image is available. "NP" China. 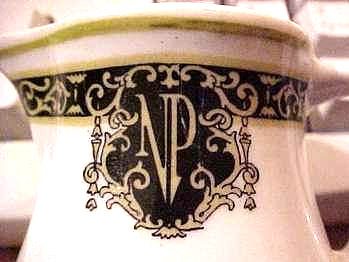 Similarly china with a logo containing the initials "NP" has sometimes been labeled as that of the Northern Pacific Railway when in fact it was used by the Netherlands Plaza Hotel. Other items. Railroads marked a hugh number of items with their initials, but not everything marked with initials has a railroad origin, even if the initials look plausible. For example, a bottle opener marked "B&O" periodically is offered in internet auctions as a "Baltimore & Ohio" (Railroad) item. See front and back images at right. The consensus among a number of veteran collectors is that these initials actually stand for "Bang & Olufsen", the upscale audio components manufacturer. This was a promotional item perhaps of interest to audiophiles. Nice ...but not railroad! We will add more to this page as we get it. New items are welcomed, but cannot publish someone else's images without permission so preferably send us photos that you have taken. Email us via the Contact Us page. Thanks to everyone who has contributed information or photos for this page.